Countdown to the 2019 Client Showcase: #3. 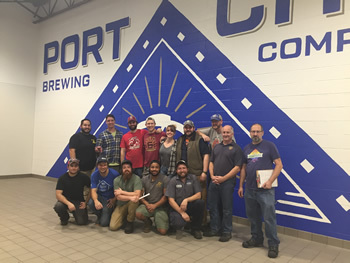 After successfully working for a number of years with the Alexandria SBDC on their domestic business, Port City Brewing Company wanted to test the waters of international trade last year and quickly discovered a need for more expert advice. Port City was put in touch with the Virginia SBDC International Business Development Program. Bill and Karen decided to open the Alexandria brewery eight years ago. “I spent 20 years in the wine business,” Bill explains. “For many of those years, I worked for the Mondavi family of Napa Valley, as the high-end brand manager for the Mid-Atlantic.” Bill’s area of expertise was in brand building, sales, and distribution. “Over those years I always enjoyed good quality beer and watched as the craft-beer industry grew and became more sophisticated,” he adds. In Alexandria, Bill found an area in need of more options for quality craft beer. “Karen found that the Metro DC area was the only top 25 Metro area in the country that did not have a craft-beer brewery that packaged their beer,” Bill notes. They decided to remedy that situation and opened their own brewery. Port City has experienced rapid growth. “We started with four people,” Bill says. “Today we have 54 employees. We’ve been hiring a lot of people since we opened.” Last year, Port City produced 16,000 barrels, with distribution in nine states and the bulk of sales in the Washington D.C. area. It seemed like a good time to look for new markets overseas. “Preparing for export was a big undertaking for our company,” Port City’s Manager of Marketing and Beer Strategy Chris Van Orden says. “The guidance from Aaron and his Virginia SBDC team has proved invaluable.” “Chris is our point person with the SBDC,” Bill adds. “He has attended embassy events arranged by the SBDC to introduce us to contacts in the UK. It’s been a tremendous help to open the door and make connections to develop our business.” Those connections have already produced results.